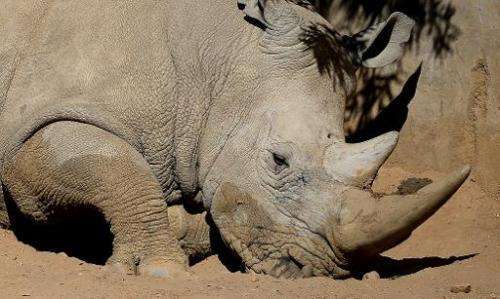 African safari operators and conservation groups said on Wednesday they plan to move up to 100 South African rhinos to neighbouring Botswana for safekeeping, as poaching levels spike to new highs. "One hundred rhinos will be captured and safely transported from South Africa... and released in Botswana's remote wilderness," two conservation groups called &Beyond and Great Plains said in a joint statement. Last year more than 1,000 rhinos were illegally killed in South Africa, home to the majority of the world's rhino population, which marks a 50 percent jump from the previous year fuelled by rising demand for rhino horn from Asia. "There is a battle for Africa's wildlife raging. Rhinos are being poached at a rate of one every nine hours," said Great Plains CEO Dereck Joubert. Discussions are still under way about where the animals will be bought from—but will likely include both public and private game reserves. "The initiative would be a good one, we need every initiative to save the species," said Isaac Phaahla, spokesman for South Africa National Parks. Most dwell in the vast Kruger Park—roughly the size of Israel—which is also the poachers' preferred hunting ground. More than 60 percent of South Africa's rhino poachings occur in Kruger.